It’s almost impossible to walk into a Target or Walmart without seeing an Instant Pot on display. If you get one as a gift, consider yourself lucky. Instant Pots have become very popular, with Amazon having record sales on them during Prime Day 2018, according to CNBC. These programmable pressure cookers retail between $70 to $99 and can be a great way to save time in the kitchen. You can do anything from cooking rice and hot cereal to preparing full meals and steaming vegetables. There are also countless Instant Pot recipes that let you make great meals with little effort. 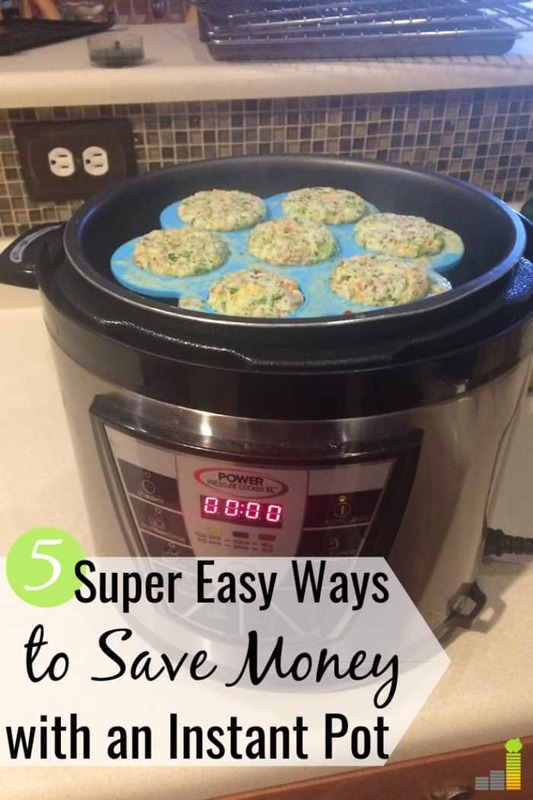 But, can you save money using an Instant Pot? Yes, you can. 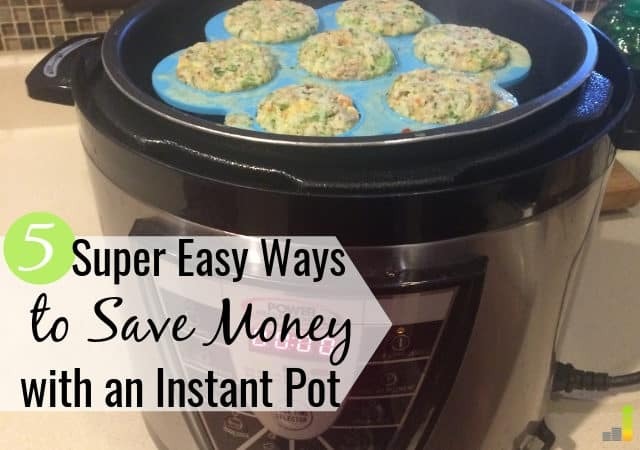 This post shares how to use the Instant Pot for simple, delicious homemade cooking and keep more money in your pocket. Price aside, an Instant Pot helps save time in the kitchen and it also helps you save money. Here are five great ways having an Instant Pot saves you money. Do you struggle with bringing lunch to work because you always run out of time to prepare it? Having an Instant Pot makes it easy to prepare meals quickly and lose this excuse. With an Instant Pot, you don’t have to settle for the same old traditional lunches of sandwiches or leftovers. You can switch it up, which may motivate you to bring your lunch more often. In return, you can save anywhere from $600 to $1,000+ per year by bringing your lunch to work and avoiding take-out meals. Sometimes I get tired of my family asking me what’s for dinner each night. Sometimes, I don’t even want to cook. This is why I love any product or meal plan that allows me to double up and cook meals in bulk. My family does like to switch meals up from time to time, but we are fine with eating the same dinner two or three nights in a row. An Instant Pot saves time by helping you plan for that. If you don’t know how to meal plan, a service like $5 Meal Plan can help. They offer a free 14-day trial and have a wealth of tools for meal planning. While a crock pot allows you to prepare your meals in bulk, you often have to wait hours for the food to cook. An Instant Pot affords you the ability to not only cook your food in bulk, but it does so in a fraction of the time. Need I say any more? Yogurt is a tasty snack but can be expensive depending on the brand and the type. Plus, the store brands are not even that healthy. However, if you love yogurt but hate paying high prices for it, you can use your Instant Pot to make your own. It’s so easy that there’s an actual button on the machine to help you make tasty, homemade yogurt. This can help make your breakfast routine run smoother and cost you literally nothing. My son loves breakfast, but it can get pricey when we’re buying name-brand boxes of waffles and french toast sticks. There are many directions you can go when making your own yogurt. Find a recipe you like and let your Instant Pot to do all the work. Let’s be honest. We’re not dining on filet mignon and strip steak every night. Sometimes cheaper cuts of meat goes on sale and that’s what you buy. If you’re lucky, you can find the more expensive cuts at a deep discount. Either way, it’s likely that you find this kind of meat difficult to prepare. If you don’t know what you’re doing, it can turn out tough and flavorless. I’m not going to lie; I still struggle with cooking certain cuts of beef. With an Instant Pot, you can cook cheaper cuts of meat to perfection and not have to wait for several hours like you would with a crock pot. This can help you enjoy more meals at home with your family and save money on groceries. Just like an Instant Pot can help you prepare different types of meats well, it’s also a great tool to use for other foods. For the past two months, I’ve been eating more meatless meals. I’m not claiming to be a vegan or vegetarian, but I do enjoy eating more healthy veggies, starches, and non-meat proteins. To my surprise, my grocery bill over the last few months has been significantly reduced. I’m still full, and I feel really good. It turns out all the meat we were eating with each meal increased our grocery bill. You can try more meatless meals if you’re looking to save money or adopt a healthier diet that relies on fewer animal fats or products. We’ve tried all of the above and they fill our family, as well as save money at the grocery store. Will an Instant Pot save you time? Yes, having an Instant Pot will save you time. Meals take less time to cook in an Instant Pot, and you don’t spend as much time preparing meals since it does the work for you. Is an Instant Pot healthy? This all depends on what you prepare. If you prepare healthy meals and use fresh ingredients, then yes, an Instant Pot is healthy to use. Instant Pot meals are safe and great alternatives to traditional cooking. How long does an Instant Pot last? A quick glance at the best Instant Pots on Amazon shows high reviews by most users. Most report using theirs for at least several years. What is the difference between an Instant Pot and crock pot? An Instant Pot and a crock pot prepare very similar meals. The difference between the two lies mainly in the amount of time needed to cook the food. An Instant Pot often takes an hour or less to cook a meal. A traditional slow cooker typically needs at least four hours for the same dish. An Instant Pot can be a great investment. It can take the place of several kitchen appliances and allows you to cook more healthy and fresh meals at home to save money. If you use your Instant Pot to do any of the things mentioned above, you’ll recoup the cost easily while adding more convenience into your life. How have you used an Instant Pot to save money? What else do you do to save money on groceries? What’s your favorite Instant Pot recipe? We recently got a instapot as a gift and can’t wait. I have found weekly meal prep has saved a ton of time and money. By grocery shopping once we by a lot less that we don’t need. It also means we don’t eat our or buy take out.